In 1996, MD degree at Federico II University of Naples – Italy. In 2002, board certification in Neurology at Federico II University of Naples – Italy. Since 2008, Assistant Professor at the Department of Neurology at Federico II University of Naples – Italy. Since 2015, Associate Professor at the Department of Neurosciences, Odontostomatology and Reproductive Sciences at Federico II University of Naples – Italy. Since 2000, Member of Italian Society of Clinical Neurophysiology (SINC) and since 2016 Secretary of SINC. Since 2010, Member of Italian Association of Peripheral Nervous System. Since 2013, Head of Neurophysiology Unit of AOU Federico II of Naples – Italy. 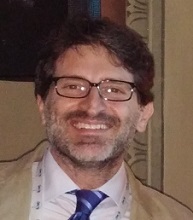 Since November 2016, Coordinator of the Bachelor degree of Neurophysiopathology Techniques at Federico II University of Naples – Italy. Main fields of research are neurophysiologic studies of acquired and inherited neuropathies. He published more than 100 papers on national and international journals. He participated as co-investigator or unit-coordinator on several funded projects ) in Charcot-Marie-Tooth disease. The lesson will provide the theoretical principles of sensory nerve conduction studies, principles of nerve stimulation technique (stimulating and recordings systems and parameters, technical errors and artifacts), principles and pitfalls of waveform analysis, hints for investigating unusual nerves and practical clinical application.